Habit: Hairs sparse to dense, glandular or not. Stem: <= 8 m, densely branched, hairy. Leaf: (2.5)3.5--8.2(10.8) cm, (0.8)1.2--2.9(3.6) cm wide, deciduous, margin ciliate. Inflorescence: short, 3--15-flowered, bracts red-brown, margins ciliate or glandular. Flower: corolla widely funnel-shaped, white to pink to salmon, upper petal yellow- to orange-blotched; stamens 5, +- equal. Fruit: longer than wide, dehiscing tip to base. Seed: ovate to fusiform, coat expanded around seed. Chromosomes: 2n=26. 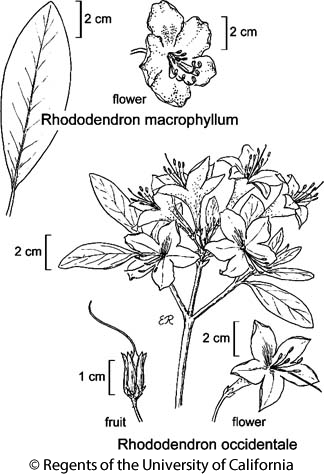 Citation for this treatment: Kathleen A. Kron & Walter S. Judd 2012, Rhododendron occidentale, in Jepson Flora Project (eds.) Jepson eFlora, http://ucjeps.berkeley.edu/eflora/eflora_display.php?tid=41152, accessed on April 25, 2019. NW (exc NCoRH), CaRH, n SNF, SNH, GV, CCo, SnFrB, n SCoRI, PR; Markers link to CCH specimen records. Yellow markers indicate records that may provide evidence for eFlora range revision or may have georeferencing or identification issues. Purple markers indicate specimens collected from a garden, greenhouse, or other non-wild location.